Mecca (Makkah al-Mukarramah, Arabic: مكة المكرمة) is a holy Islamic city in Saudi Arabia's Makkah province, in the historic Hejaz region. It sits in a valley surrounded by low hills and has a population of 1,294,167 (2004 census). The city is located 45 miles (73 kilometers) inland from Jeddah, in the narrow sandy Valley of Abraham, 277 metres (909 ft) above sea level. It is located 50 miles (80 kilometers) from the Red Sea. The city is revered by Muslims for containing the holiest site of Islam, the Masjid al-Haram. A pilgrimage that involves an extended visit to the city is required of all able-bodied Muslims who can afford to go at least once in an individual's lifetime. People of other faiths are forbidden from entering the holy city. The English word mecca, meaning "a place to which many people are attracted" is derived from Makkah. Although Mecca is the religious capital of Saudi Arabia, the political capital of the nation is Riyadh. Mecca is the original English transliteration of the Arabic name. In the 1980s, the Saudi Arabian government and others began promoting the transliteration Makkah (in full, Makkah al-Mukarramah), which more closely resembles the actual Arabic pronunciation. The spelling Makkah is becoming more commonplace, taken up by many organizations, including the United Nations, U.S. Department of State and the British Foreign and Commonwealth Office, but the spelling Mecca remains in common use. The city of Mecca in the Kingdom of Saudi Arabia is the Islamic religion’s holiest city. Its position as center of the Islamic world is attributed to it being the birthplace of the Prophet Muhammad and to the religion he founded. Ancient Mecca was an oasis on the caravan route linking the Mediterranean world with South Arabia, East Africa, and South Asia. It had become an important trade and religious center, known as Macoraba, by Roman and Byzantine time. Mecca and Medina (the second holiest city after Mecca) are located in an area known as the Hijaz, (meaning "barrier") in the western region of the Arabian peninsula. The Tropic of Cancer runs through the center of this region. Mecca is in the Sirat Mountains, about 50 miles from the port city of Jidda (Jeddah). The holiness of Mecca was established before the days of Muhammad, traceable to Ka'bah and the Spring of Zamzam. 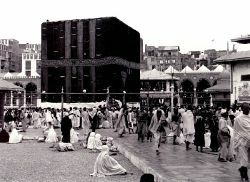 The Ka'bah is a large cubical building located inside Islam's holiest mosque Masjid al-Haram. 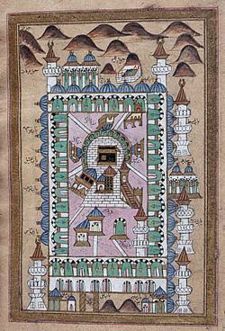 The Ka'bah is also called al-Baytu’l-Ḥarām (البيت الحرام "The Sacred House"). For the Muslim community, the Ka'bah holds a place analogous to that of the Temple Mount in Jerusalem for Jews. According to the Qur'an, the Ka'bah was built by Ibrahim (Abraham) and his son Ismail (Ishmael), and has been a religious center ever since. The Ka'bah can be called the holiest place in Islam. Muslims throughout the world turn in the direction of the Ka'bah for their daily prayers, symbolizing unity in worshiping one God. The Black Stone is an object of reverence, said by some to date back to the time of Adam and Eve, concealed during the great flood and later restored to Abraham for inclusion in the original Ka'bah. The Stone is the eastern cornerstone of the Ka'bah. According to legend, the stone, originally white, was given to Adam on his fall from paradise. It has turned black through absorbing the sins of the thousands of pilgrims who have kissed and touched it. The Well of Zamzam (or Zamzam Well or simply Zamzam) is a well located within the Masjid al Haram near the Ka'abah. Muslims believe that the Zamzam well was revealed to Hagar, wife of Abraham and mother of Ishmael. According to Islamic legend, Abraham had left Mecca on God’s command, leaving Hagar and Ishmael with only some water and dates. When the water ran out, Hagar ran between the hills of Safa and Marwa in search of more. She made the journey seven times, until the angel Jibril appeared and struck the ground with his wing. A spring appeared, which Hagar then confined with sand and stones. The Zamzam Spring, from which the well draws, is considered by Muslims to be a tributary of the Waters of Paradise. The water continues to flow to this day. It is considered divinely blessed, able to satisfy both hunger and thirst, as well as cure illness. Pilgrims make every effort to drink of this water during their pilgrimage to Mecca. "The Sacred Mosque", sometimes called "The Noble Sanctuary" is not only the largest mosque in Mecca, but in the world. It surrounds the Ka'bah, to which Muslims turn while offering daily prayer. It is considered to be the holiest place on Earth by devotee Muslims. The mosque is also commonly known as the Haram or Haram Sharif. Enclosed within the vast structure are not only the Ka'bah but the Zamzam Well, the Hijr and the hills of Safa and Marwa. The Haram is ringed by seven towering minarets and sixty-four gates. The structure covers an area of 356,800 square meters including the outdoor and indoor praying spaces and can accommodate nearly one million worshippers during the Hajj period. The current structure is the result of a large extension project begun in 1982 under the sponsorship of the late King Fahd. The importance of the mosque is twofold. It not only serves as the common direction towards which Muslims pray, but is also the main location for pilgrimages. According to Islamic theology, the mosque was first built by the angels before the creation of mankind, when God ordained a place of worship on Earth to reflect the house in heaven called al-Baytu l-Maˤmur (Arabic: البيت المعمور), which translates to 'The Worship Place of Angels'. The Ka'abah is believed to be directly below the heavenly Al-Baytu l-Maˤmur. The first Ka'bah was built by angels, and Adam was the first human to re-build it. From time to time the mosque was destroyed then built anew. According to popular belief it was famously built by Ibrahim with the help of his son Ismael. They were ordered by Allah to build the mosque and the Ka'bah. The Black Stone is situated near the eastern corner of the Ka'abah, and is believed to have 'fallen from heaven' and turned black due to man's misdeeds. After the Hijra, upon Muhammed's victorious return to Mecca, the people of Mecca themselves removed all the idols in and around the Ka'aba and cleansed it. This began the Islamic rule over the Ka'aba, and the construction of the mosque around it. The Hajj is the annual pilgrimage to Mecca made by Muslim devotees. It is the fifth of the Five Pillars of Islam, an obligation that must be carried out by every able-bodied Muslim whose health and finances allow them to do so, at least once in their lifetime. A pilgrim is required, before he sets out, to redress all wrongs, pay all debts, and plan to have enough money for their journey and the support of their family while away. The Haram is the focal point of the Hajj and Umrah pilgrimages that occur in the month of Dhu al-Hijjah in the Islamic calendar and at any time of the year. The Hajj was an ancient ritual, even in the time of Muhammad in the seventh century. Some elements of the Hajj trace back to the time of Abraham, around 2000 B.C.E. Muhammad was known to regularly perform both the Hajj and Umrah, even before he began receiving revelations. Prior to the age of the European world explorations, the pilgrimage to Mecca was the single largest expression of human mobility. It is estimated that any where from 2 to 4 million pilgrims now make the journey each year. Picture of the Ka'aba taken in 1880. 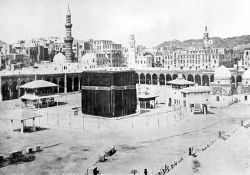 Academic historians state with certainty only that Mecca was a shrine and trading center for a number of generations before the Prophet Muhammad. The extent of Meccan trade has been hotly debated. Some historians believe that Mecca was a waypoint on a land route from southern Arabia north to the Roman and Byzantine empires, and that Arabian and Indian Ocean spices were funneled through Mecca. Patricia Crone, in her book Meccan Trade and the Rise of Islam, argues that the Meccans were small merchants dealing in hides, camel butter, and the like. According to the Qur'an and Muslim traditions, the city was attacked by an Ethiopian Aksumite army led by Abraha in 570, the year of Muhammad's birth. According to legend, the attack was said to have been repelled by stones dropped by thousands of birds, followed by a plague. Before the time of the Islamic prophet Muhammad, Mecca was under the control of the tribe known as [Quraish]]. Muhammad, a member of Banu Quraish, (meaning Sons of Quraish) was exiled from the city for preaching against paganism, returned to the city in triumph in the year 630 C.E., and after removing the cult images from the Ka'aba, dedicated it as the center of Muslim pilgrimage. After the rise of the Islamic empire, Mecca attracted pilgrims from the extensive empire, as well as a year-round population of scholars, pious Muslims who wished to live near the Ka'aba, and local inhabitants who served the pilgrims. Due to the difficulty and expense of the Hajj, the annual pilgrimage was small compared to the millions that swell Mecca today. Pilgrims arrived by boat, at Jedda, and came overland, or joined the annual caravans from Syria or Iraq. Mecca was never the capital of the Islamic empire; the first capital was Medina, some 250 miles (400 km) away. The capital of the caliphate was soon moved to Kufa by the fourth Caliph Ali and then to Damascus by the Ummayads and Baghdad by the Abbasids and then to Cairo after the Mongol invasion, and then at last to Constantinople by the Ottomans. Mecca re-entered Islamic political history briefly when it was held by Abd-Allah ibn al-Zubayr, an early Muslim who opposed the Umayyad caliphs. The caliph Yazid I besieged Makkah in 683. Thereafter the city figured little in politics; it was a city of devotion and scholarship. For centuries it was governed by the Hashemite Sharifs of Mecca, descendants of Muhammad by his grandson Hassan ibn Ali. The Sharifs ruled on behalf of whatever caliph or Muslim ruler had declared himself the Guardian of the Two Shrines. Mecca was attacked and sacked by Ismaili Muslims in 930. 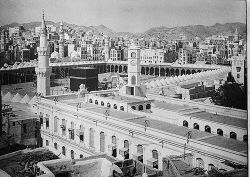 In 1926, the Sharifs of Makkah were overthrown by the Saudis, and Mecca was incorporated into Saudi Arabia. On November 20, 1979 two hundred armed Islamist dissidents seized the Grand Mosque. They claimed that the Saudi royal family no longer represented pure Islam and that the mosque, and the Ka'aba, must be held by those of the true faith. The rebels seized hundreds of pilgrims as hostages and barricaded themselves in the mosque. The mosque was eventually retaken, after some bloodshed, and the rebels were executed. Mecca is at an elevation of 277 m (910 ft.) above sea level. The city is situated between mountains, which has defined the contemporary expansion of the city. The city centers around the Masjid al-Haram (holy place of worship). The area around the mosque comprises the old city. The main avenues are Al-Mudda'ah and Sūq al-Layl to the north of the mosque, and As-Sūg as Saghīr to the south. Houses near the mosque have been razed and replaced with open spaces and wide streets. Residential complexes are more compacted in the old city than in residential areas. Traditional homes are built of local rock and are two to three stories. The city has a few slums, where poor pilgrims who were unable to finance a trip home after the hajj settled. The mayor of Mecca is appointed by the king of Saudi Arabia. A municipal council of 14 locally elected members is responsible for the functioning of the municipality. 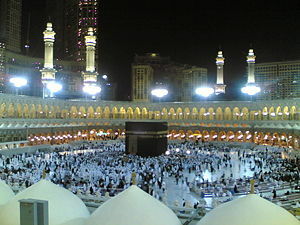 Mecca is also the capital of Makkah province, which also includes neighboring Jeddah. The governor was Prince Abdul-Majid bin Abdul-Aziz who ruled from 2000 until his death in 2007. On May 16, 2007, Prince Khalid al-Faisal Al Saud was appointed as the new governor. The city has grown substantially in the last several decades, as the convenience and affordability of air travel has increased the number of pilgrims participating in the Hajj. Thousands of Saudis are employed year-round to oversee the Hajj and staff the hotels and shops that cater to pilgrims; these workers in turn have increased the demand for housing and services. The city is now ringed by freeways, and contains shopping malls and skyscrapers. The Kingdom of Saudi Arabia is closed to tourists and Mecca itself is off limits to all non-Muslims. Road blocks are stationed along roads leading to the city, with officials conducting occasional random checks to confirm that intending visitors are legitimate pilgrims and in possession of the required documentation. The main airport has a similar security policy. As one might expect, the existence of cities closed to non-Muslims and the mystery of the Hajj aroused intense curiosity in European travelers. A number of them disguised themselves as Muslims and entered the city of Mecca and then the Kaaba to experience the Hajj for themselves. The most famous account of a foreigner's journey to Makkah is A Personal Narrative of a Pilgrimage to Mecca and al-Madina, written by Sir Richard Francis Burton. Burton traveled as a Qadiri Sufi from Afghanistan; his name, as he signed it in Arabic below his front piece portrait for "The Jew, The Gypsy and al-Islam," was al-Hajj 'Abdullah. Both Mecca and Medina are cities of great importance to the Islamic religion. Restricting access to them is done with the intention of preserving them as places of peace and refuge for devotees and to preserve their sanctity. ↑ T. F. Keane, Six months in Meccah: an account of the Mohammedan pilgrimage of Meccah (London: Tinsley, 1881). ↑ Karen Armstrong, Islam: A Short History (New York: Modern Library, 2000, ISBN 0679640401). ↑ 3.0 3.1 3.2 3.3 3.4 "Mecca and Medina" Encyclopedia Britannica. Fifteenth edition, 2007. (Vol. 23: 698-699). ↑ Associated Press, Prince Abdul-Majid, Governor of Mecca, Dies at 65., May 7, 2007. Retrieved September 15, 2016. ↑ Saudi Press Agency, Prince Khalid Alfaisal Appointed As Governor Of Makkah Region, May 16, 2007. Retrieved September 15, 2016. ↑ "Mecca" World Book Encyclopedia, 2003 edition. Volume M, 353. ↑ Places of Peace and Power. Mecca, Saudi Arabia. Retrieved September 15, 2016. Places of Peace and Power, "Mecca, Saudi Arabia" sacredsites.com. Retrieved September 15, 2016. Rosenberg, Matt. Mecca, About.com. Retrieved September 15, 2016. Samex. The Holy City of Makkah. This page was last modified on 11 September 2018, at 16:36.